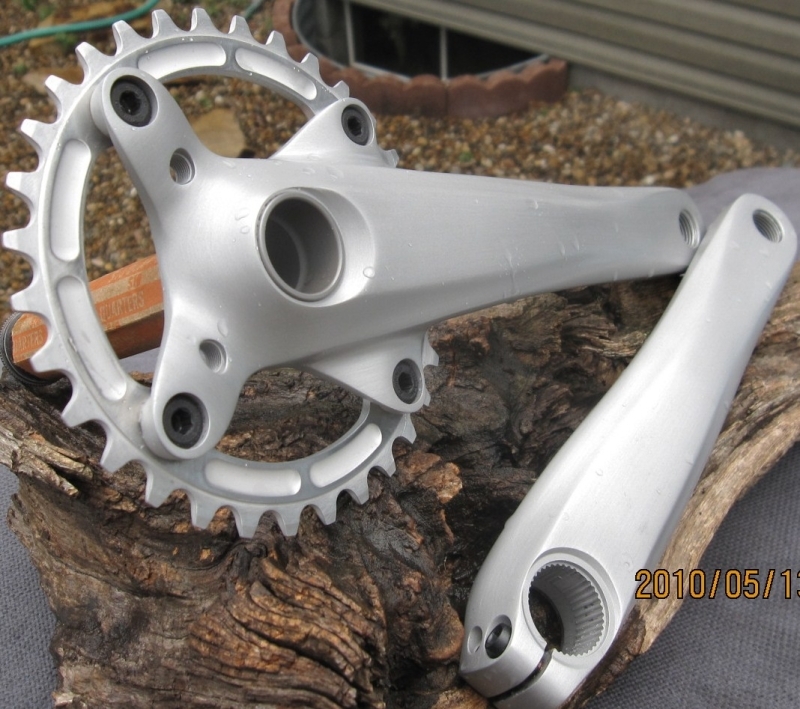 Thread: How to cleanup XTR (or any) crank arms? 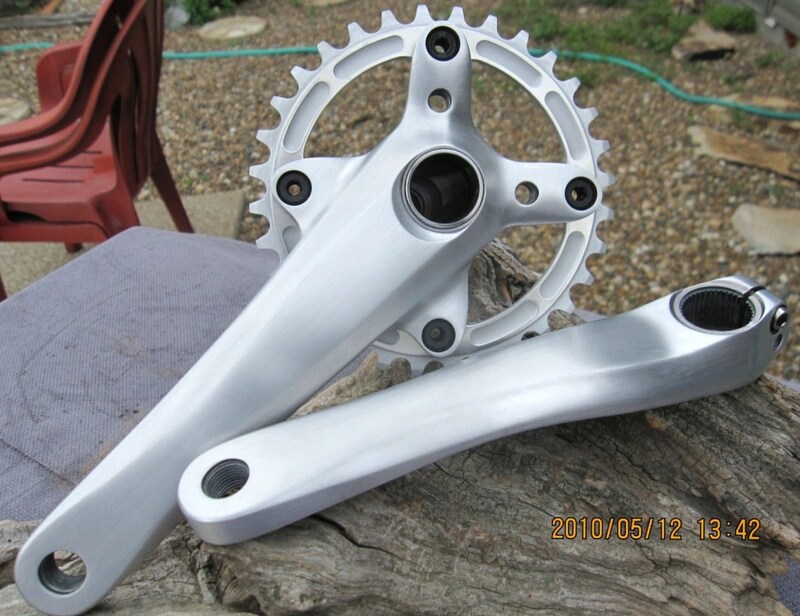 i just scored a beatup XTR M970 crankset on eBay, but they're in pretty rough shape. i bought different grit sandpapers at Lowes (sheet, wet sponge, and some buffing and flap wheels for my Dremel) in grits from 150 to 600. i couldn't find anything finer than 600. any suggestions? also, i read somewhere that you can use lye (aka caustic soda or sodium hydroxide) to remove the anodizing? it's commonly used as drain opener but i can't find it at any of the obvious places. i was inspired by driver bob's first set of 960s to get my 970s nice and shiny. bob, are you doing everything by hand, i.e. sheets and sponges? or are you using power tools (drill and/or dremel)? anybody have pics of beautified 970 arms? Last edited by alexrex20; 06-10-2010 at 03:12 PM. Oven cleaner works well and you should be able to find that pretty easily. 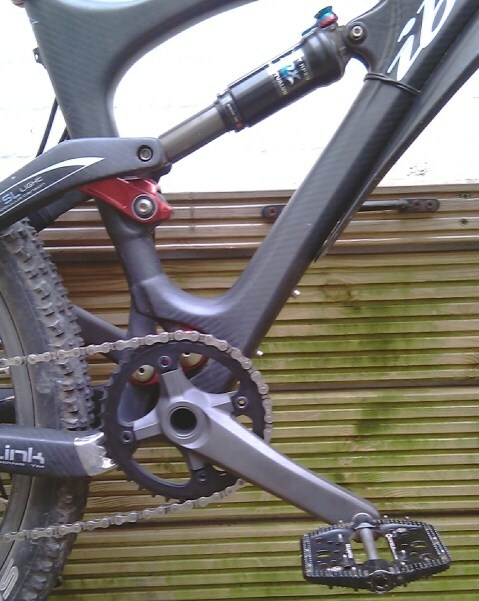 Here is a sweet carbon Ibis Mojo owned by Gavin, London, UK with a unique configuration. Gavin installed his XTR970 single speed cranks placing the bash-guard on the inside and the ring on the outside of the 104 tabs for the 54mm chain line required for his Rolf hub. these are cool, how much work to get them like this? If you want 1500 - 2000 grit, go to an auto parts store and look in the paint section. thanks for the tip. i didn't think to check there. those aren't mine. they belong to mitch66. i found the pic in this thread. The anodizing is removed with sodium hydroxide (NaOH), also known as lye or caustic soda. I mixed 2 liters of water and four table spoons with caustic soda. Put the parts in the soda and let it rest for some minutes until the ano slips from the alu. Use steel wool or a fine Scotch Brite to remove the ano and rinse the parts well in warm water when finished. The parts are then wet sanded with grade 600 paper. For the best result, finish it of with grade 1200. Finally, give the parts the long lasting glossy finish with Autosol Chrome polish or some other metal polish. The whole job took me about one hour. USE GLOVES AND PROTECTIVE EYEWEAR WHEN WORKING WITH CAUSTIC SODA. DO THE JOB OUTDOOR OR IN A WELL VENTILATED ROOM. per the recommendations, i'll pick up some oven cleaner and sandpaper from AutoZone tomorrow. then, i just need the cranks to show up at my door! What he said, and I do everything by hand. Finest Dremel wheel I can find is 240 and that would only be good for removing anodizing (but I don't think it leaves a very even finish). I also use hand soap reduce the friction between paper and metal a little. After the fine paper I clean them up with some metal polish and then put a felt wheel on the Dremel with polishing compound. There's no reason to use oven cleaner or any other caustic to remove the factory finish. It will come off with light sanding everywhere except the bolt holes. If your wanting to take a bit of work out of this job try buffing to your final finish. After you finish sanding with 220 you can use a spiral sewn buff wheel and black Tripoli compound. This compound will smooth out the scratches and polish. If you want to take it a step further you can have a second softer wheel and use white compound to bring it to a lustrous shine. All you need is a grinder that uses a 6" wheel for your buff. You can also do a brushed satin finish that looks really good and is easy to maintain with a green 3M Scotch Bright pad. Wow! 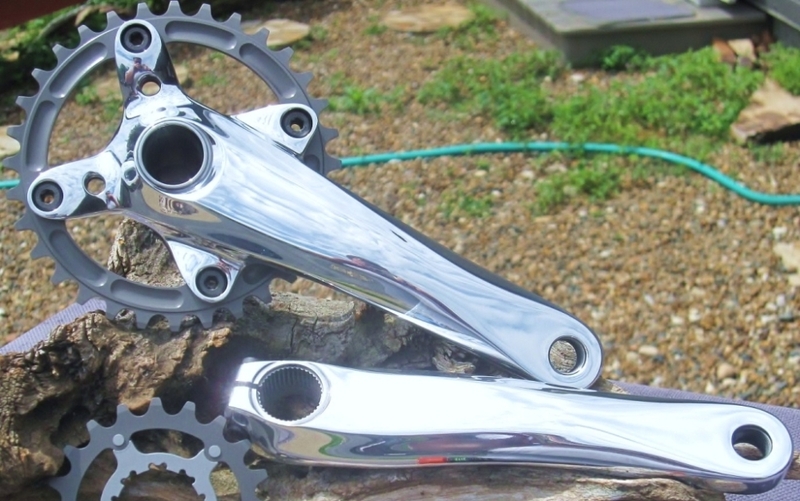 Nice polish job on those cranks. They look chrome plated. Very nice guys! I have great appreciation for this kind of effort and attention to detail. thanks for the tips craz8. is that last pic chrome plated, ceramic coated, or just pure shine from the buffing wheel? No coating on either set just buffed with a wheel. The satin brushed was also polished bright making sure all scratches were removed then a 3M pad was used to give them the brushed effect. I did apply a clear ceramic over the brushed later for protection. As you can see in this pic of the same set the look changed, but it's more in the photo than in person and still looks good. those look like crap cause of the bolt holes. how much would you charge if i sent you my XTR's to to do?? they're pretty tore up. i forgot to take pics before i started, but the non drive side was much worse than the drive side. 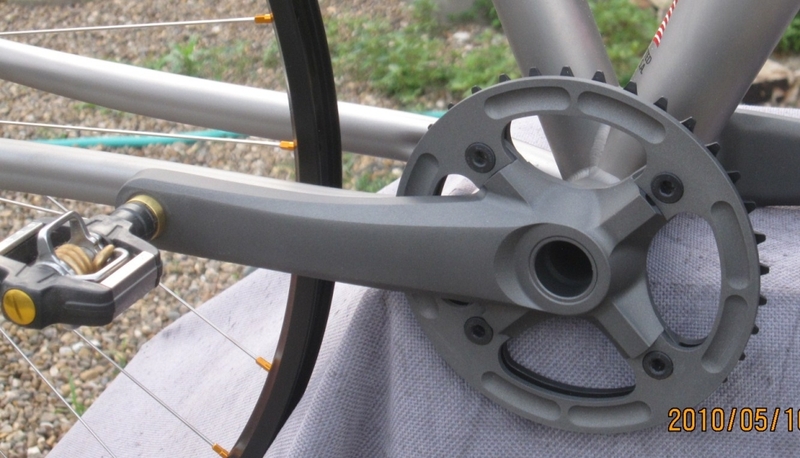 there wasn't even a hint of Shimano or XTR logo. i didn't use any caustic. maybe i should have. this was a PITA to do by just sanding!!! i'm not sure i want to attempt the full polish. it's too much work! i may just clean this up a bit more and be happy. getting all the anodizing off the spider by just sanding was a nightmare. To get them really clean you need a lot more than 2 hours into them. I spent at least 2 hours just with the base sanding to remove the ano. The key to a great finish (IMO) is in the prep stages (220, 400 and 600 grit). I've got around 7-8 hours with these grades before I start with the 1500 and polishing. At the end of the day though it's what you are happy with, the burnished finish still looks way better than the beat up original anodizing. i agree that the satin finish looks better. the stock anodizing was tore up, and i was able to get out many of the nicks and dings. these were ridden hard! my arms are too sore from jet-skiing all day yesterday and then sanding all night, but i will continue to work on them. i put in another 2hrs after that last pic, using some 600grit sheet. i'm very slowly getting there haha. my crank arms are really beat up so i'm thinking i may just leave it as a satin finish, so the imperfections aren't as obvious. alexrex20....I guess I should have mentioned how much easier it would be to hand sand the arms if you used a block for your paper. A rubber 3X4sanding block holds the paper flat, you can apply even flat pressure and sand all the surfaces even and smooth. The block also works well using the ends in narrower spots. Another thing after a few strokes have a rag that you can wipe the paper with to clean any build up on the paper. It keeps it cutting evenly. When you do your final grit do it wet. Holding it under a slow dripping water keeps the paper clean and cool for a nice final finish.